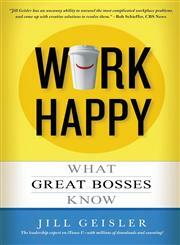 The Title "Work Happy What Great Bosses Know" is written by Jill Geisler. This book was published in the year 2014. The ISBN number 1455547077|9781455547074 is assigned to the Paperback version of this title. This book also comes in Hardback . This book has total of pp. 304 (Pages). The publisher of this title is Hachette Groupe Livre. We have about 6435 other great books from this publisher. Work Happy What Great Bosses Know is currently Available with us.